The kisspeptin neuronal system, which consists of the neuropeptide kisspeptin and its receptor Gpr54, is considered in mammals a key factor of reproductive regulation, the so-called hypothalamic-pituitary-gonadal (HPG) axis. However, in non-mammalian vertebrates, especially in teleosts, the existence of kisspeptin regulation of the HPG axis is still controversial. A research team led by Prof. Oka and Dr. Kanda from the Department of Biological Sciences, the University of Tokyo, applied multidisciplinary techniques to a teleost fish, medaka, and examined possible kisspeptin regulation of the HPG axis. First, they generated knockout medaka for kisspeptin-related genes and found normal gonad development and reproduction. Moreover, the electrical activity (action potential firing) of GnRH1 neurons was not altered by kisspeptin application. Furthermore, in goldfish, in vivo kisspeptin administration did not show any positive effect on HPG axis regulation. However, as kisspeptin genes are evolutionary conserved among vertebrates except birds, they surmised that kisspeptin should have some important non-reproductive functions in vertebrates. Therefore, to discover novel functions of kisspeptin, they generated a gpr54-1:EGFP transgenic medaka, whose gpr54-1 expressing cells are specifically labeled by EGFP. Analysis of the axonal trajectories of gpr54-1:EGFP expressing neurons showed that these neurons in a specific area of the brain send axons to the pituitary gland, the central hormonal control organ, and are probably involved in the regulation of hormone release that are not involved in the gonadal maturation. Furthermore, a combination of genome-wide DNA sequencing, histological and electrophysiological analyses revealed various novel neural systems that are controlled by kisspeptin neurons. This new strategy to genetically label receptor-expressing neurons (gpr54-1 expressing cells in the present article) gives insight into various kisspeptin-dependent neuronal systems that may be evolutionary conserved in vertebrates. Figure 1: Schematic illustration of possible neural pathways of the kisspeptin neuronal system, comprised of multiple peptidergic neural systems in mammals (left) and in teleosts (right). 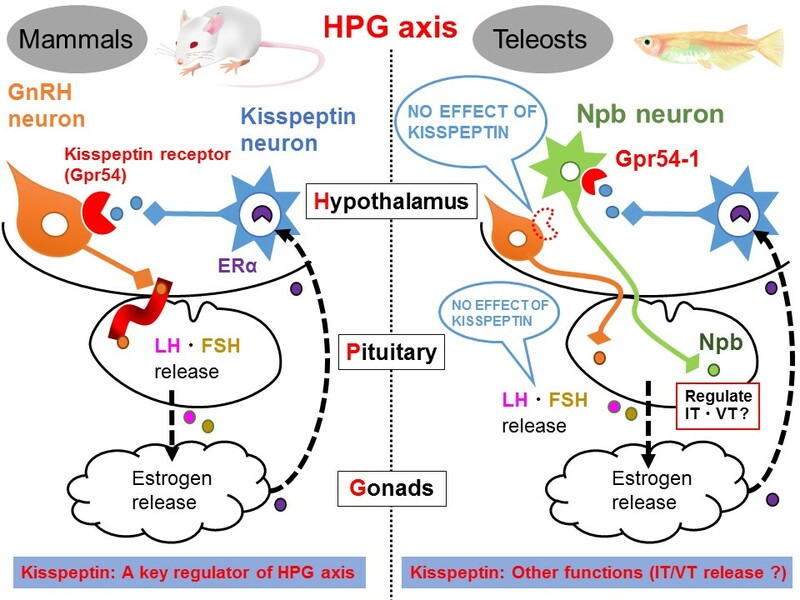 In mammals, the kisspeptin neurons receive estrogen signals from the gonads via estrogen receptors ERα (estrogen receptor α) and play a pivotal role in HPG axis regulation by directly stimulating GnRH neurons, which express kisspeptin receptors (Gpr54). On the other hand, in teleosts, kisspeptin does not stimulate GnRH neurons. Instead, the gonadal estrogen facilitates NVT Kiss1 neuron activities via ERα. Next, NVT Kiss1 neurons stimulate vPOA Gpr54-1/Npb neurons whose axon terminals are intertwined with those of IT and VT neurons in the pituitary. The current study hypothesized that Npb may have some regulatory effects on IT/VT secretion there. Note that the expression of Gpr54 in GnRH neurons has only been observed in mammals so far and is probably not required by non-mammals. Therefore, it is suggested that the common ancestor of mammals may have begun to express Gpr54 on GnRH neurons.